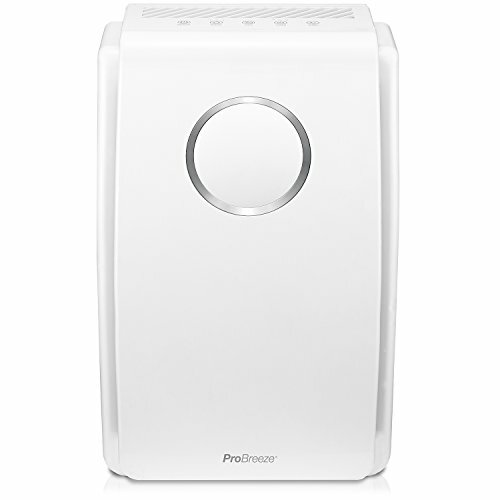 The 5-in-1 Air Purifier from Pro Breeze is perfect for allergy sufferers, those with a sensitivity to airborne particles and for general air cleanliness at home. With a Pre Filter, True HEPA filter, Cold Catalyst and Activated Carbon Filter, this highly efficient air purifier is able to capture 99.97% of dust and allergens with a Clean Air Delivery Rate (CADR) of 218. The built-in Negative Ion Generator binds to and neutralises airborne pollutants such as dust, pollen and smoke for cleaner air. Be it pet hair, pollen, dust, tobacco smoke or emissions produced by household electronics, this combination of five independent air purifying technologies ensures a cleaner air environment throughout the day. A four stage filtering process within a single removable filter allows for optimal clean air delivery. The large surface area ensures an efficient flow of air throughout the purifying process. Stage 1: Pre-Filter - Captures large airborne particles including dust and pet air - this helps to extend the life of the filter. Stage 2: True HEPA Filter - Removes any smaller particles that pass through the pre-filter including dust mites, pollen, pet dander and other allergy triggers. 99.97% of 0.3 micron particles are captured at this stage. Stage 3: Activated Carbon Filter - Efficiently absorbs contaminants, impurities, household odours and harmful Volatile Organic Compounds (VOC's). Stage 4: Cold Catalyst Filter - A final guard to trap any last remaining impurities. 5-IN-1 AIR PURIFICATION: Captures up to 99.97% of airborne particles, dust, pollen, smoke, odours, mould and pet dander with a Pre-Filter, True HEPA Filter, Cold Catalyst and Activate Carbon Filters - CADR Rated 218+. NEGATIVE ION GENERATOR - With the flick of a switch, the ultra-powerful negative ion generator binds to and neutralises airborne pollutants for a cleaner environment. It is independently controlled and can be turned on and off as desired. BUILT-IN TIMERS: Auto-on and Auto-off timers enable the air purifier to automatically switch-on or off after 1, 2, or 4 hours and a convenient nighttime mode ensures peaceful, undisturbed sleep throughout the night. MULTIPLE USES: Perfect for pet owners, smokers, hay fever sufferers, children, babies or anybody looking to improve air quality, remove unwanted smells and prevent harmful pollutants in their home or working space. Fully CE and RoHS Compliant.